Despite a long silence from us, there’s still lots going on at Yarnauwi, not least our ongoing attempt to clean up historic dumping in our erosion gullies. We feel like we’re closing in on the last 30 metres or so of junk to clear and now we’re so close to finishing it can sometimes be difficult maintaining motivation! While most of the material remaining is steel or demolition rubble, both of which we recycle or repurpose, there are still pockets of wonder in the form of various plastic domestic items. Happily, the plantings established in previously cleared areas are now well-established and working to stablise the exposed gully walls as well as restore them as habitat and an ephemeral waterway. We’ll write with more updates soon, but in the meantime, enjoy these treasures from the deep. Specimen #52: Wobbling bear in winter attire. Specimen #53: Battery operated toy train. Specimen #54: Lightly soiled Boggle Junior console, dating from around 1988. Some cosmetic wear and tear. 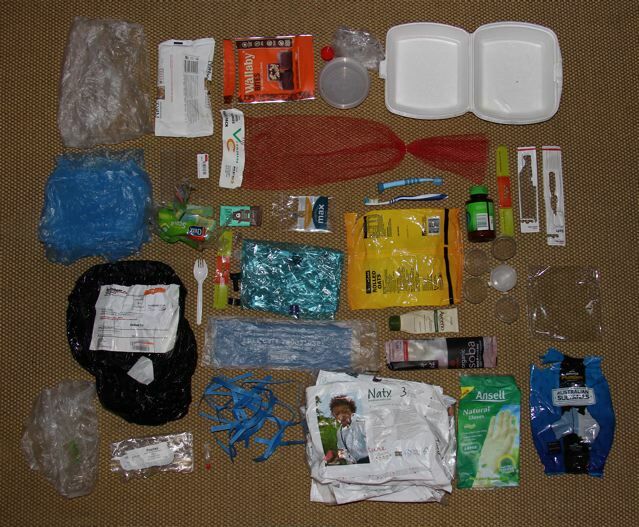 The contents of the Plastic-free July dilemma bag: 494 grams of plastic waste. A month ago we embarked on our attempt to avoid single-use plastics for the month of July. We were inspired to experiment with this waste-reduction challenge by our concern both about the plastics in our home and farm (the legacy of which we’re still hauling from our gullies), as well as the presence of plastics of all descriptions in the rockpools and high-tide marks of the nearby coast. 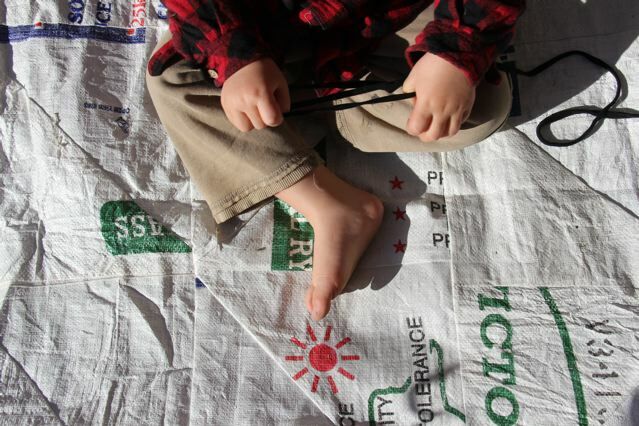 Over the last couple of years we’ve assembled an impressive collection of woven polypropylene sacks. Typically used as bags for stock feed or pasture seed, in the spirit of Plastic-Free July, I thought it was time to put these single-use plastics to use and upcycle them into a patchwork, water-proof picnic blanket. 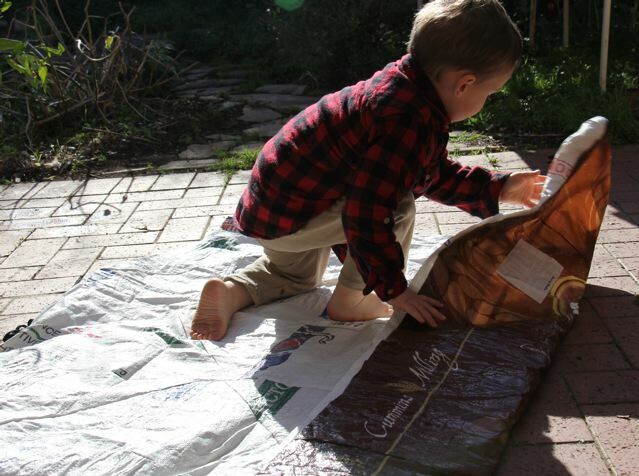 Asher demonstrates correct operating procedure, also showing the heavier backing. 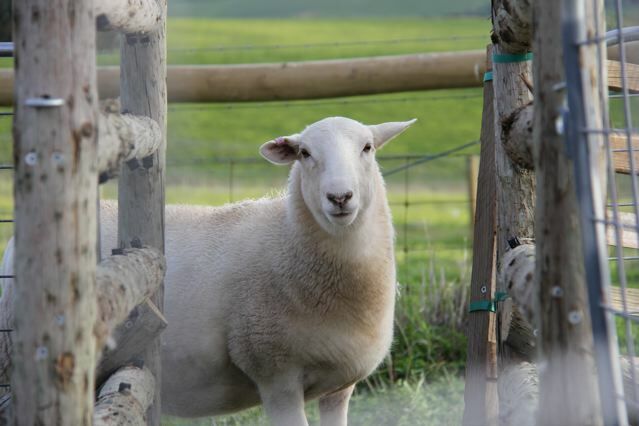 One of our hoggets, sizing up the new facilities. We’re great fans of temporary. Not aiming for permanence tends to mean that ideas can be trialled inexpensively, can be easily changed and that learning from failure can be quick and low-impact. In that spirit, as we develop the sheep enterprise of the farm, we’ve tried to keep things low-key. 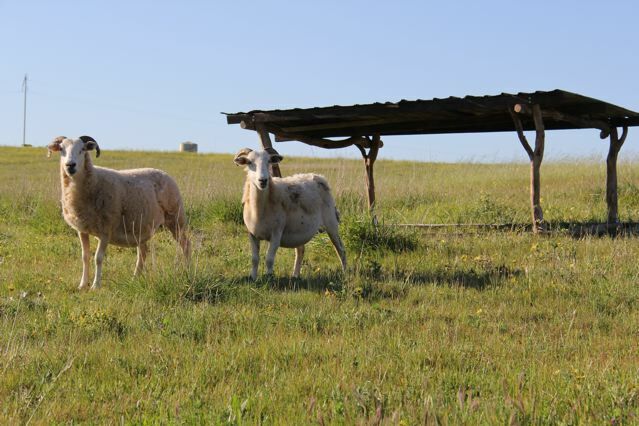 For yards, we use locally-made portable panels, but when working closely with sheep, we found the mesh sides problematic due to the ease with which horns or feet can become entangled. In more established circumstances, yards would have a working race for such a purpose, but the cost of a manufactured race can be steep. It was time to get out the tools and make our own. 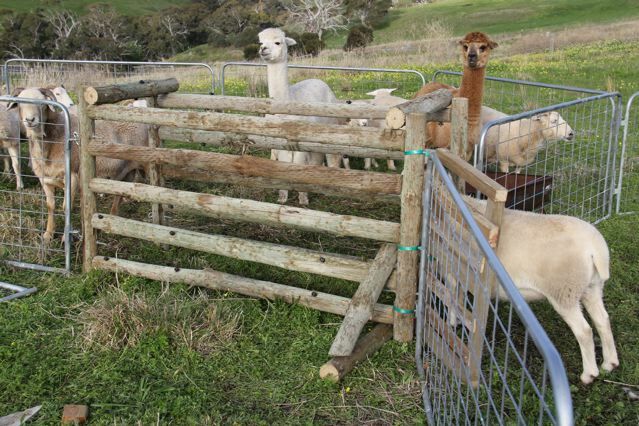 The ‘new’ working race in position, with sheep, also in position. As a further refinement, we need to attach bracing to the far end to help it stand up to the inevitable knocks and bumps. 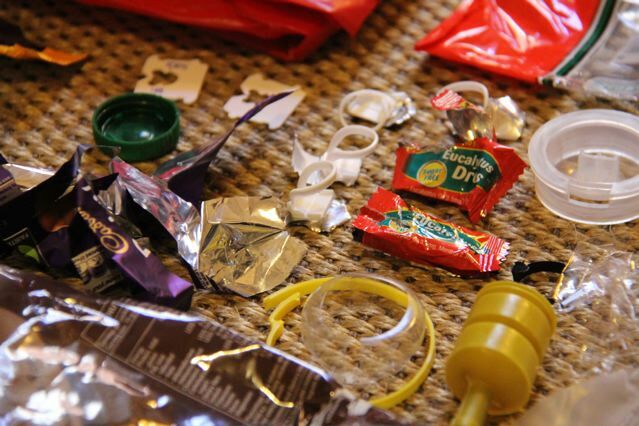 Some of the treasures accumulated in a month of auditing our plastic waste. A side effect of working to restore our gullies from rubbish dumps to some version of a functional waterway is that we’ve become a bit twitchy about waste. We’re constantly surprised at the kinds of things that have ended up pushed over the banks. We’ve written before about discoveries like the garbage bags filled with empty recyclable milk bottles that implode into confetti after being in the elements for a decade, or the long-expired discount cards for long-bankrupt franchises preserved by their plastic lamination. Perhaps there’s no more weirdly poetic illustration of the persistence of plastic waste than the discovery of a midden of ‘disposable’ nappies, their contents long composted, but the nappy itself only slightly aged by the elements. Now that we have a new entry to the property, it was time to knock together a sign announcing the property’s name. 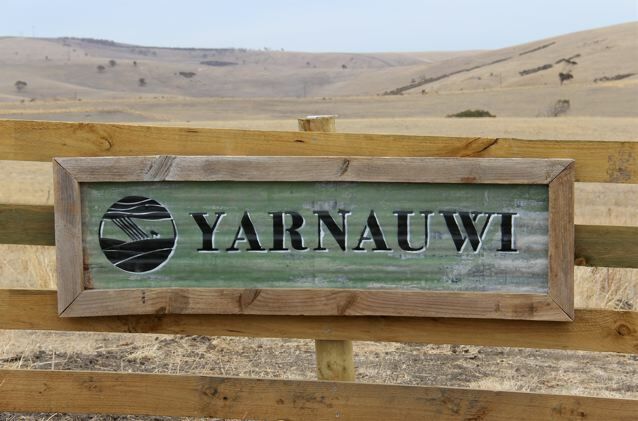 In August 2014, we were granted the name Yarnauwi by Kaurna Warra Pintyanthi, a property name that both describes the landscape (“bald (hills) water”), and references the traditional meeting ground Yarnauwingga just beyond the back fence. In the spirit of our intentions for the property, the sign is entirely constructed from materials salvaged from around the farm: a surviving piece of corrugated iron and timbers seasoned in the mud and sun of the gully floors. The text and logo are stencilled with spray-paint. 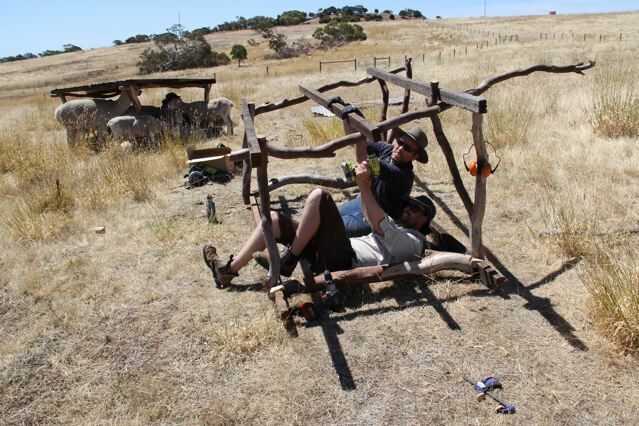 The rather wonky nature of the timbers made it tricky to hang, but we’re reasonably confident it’s level-ish. Give it a honk next time you’re passing! 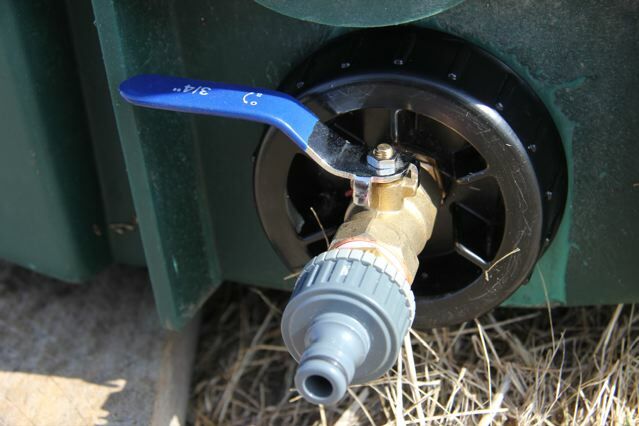 The new Trough Hose Outlet Mark 2 (aka. THOM2), in position. 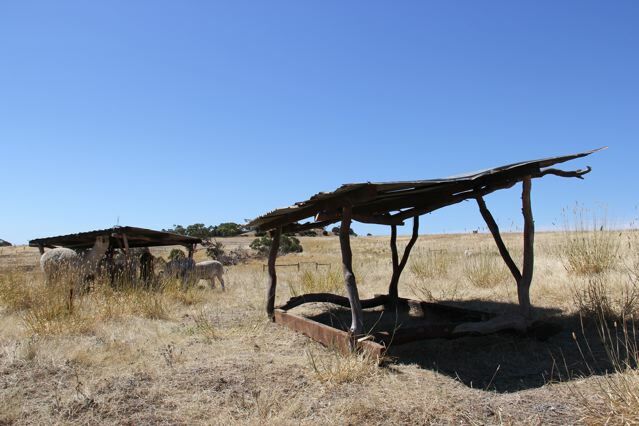 With recent temperatures climbing into the 40s (about 107 degrees Fahrenheit), and tree-induced shade still a few years away, we’ve constructed another moveable sheep shelter to ensure our sheep and alpacas have a cooler place to recline on the most hostile of days. The moveable sheep shelter in fresh pasture.